Recently, Sandra L. Brown was honored to be interviewed by “Ruth” at Relationship Talk, an interesting site featuring bloggers, articles, interviews and an interactive forum. We think there is much to learn about relationships, especially toxic ones, how to avoid them and find the one who truly helps you be happy. Many people wake up one day, and find that life isn’t at all what they imagined it to be. The relationship they are in is probably the worst nightmare they could possible imagine – but still, they stick it out, making excuses for their partners outrageous behaviors, hoping that from tomorrow it will be different, but it never is. I asked Sandra L. Brown, M.A., CEO of The Institute for Relational Harm Reduction & Public Pathology Education, who is a specialist psychopathology, if she would answer some of my questions on the subject, to which she agreed. If anything here rings true to your own relationship or a relationship of a loved one, or if you would like to educate yourself further on the issue, please check out The Institute for Relational Harm Reduction & Public Pathology Education. RT: You are the founder of The Institute for Relational Harm Reduction & Public Pathology Education. Could you tell us a little about the institute and how it came to be? SB: We are part of everything we experience. The years of being exposed to pathology as a child had a big impact on me. I was learning about psychopathology without ever realizing it. It was creating my career. My father was narcissistic; other more distant family members were also pathological. My mother divorced my father. He was later murdered by a Psychopath. My mother remarried a charming man who turned out to be highly sociopathic. I became involved in victims rights after my fathers murder. I went on to college and got a master degree in counseling and started my specialty focus in cluster B personality disorder. For the first 10+ years I worked in trying to treat cluster B disorders. Treatment outcomes are laborious and part of the disorder is that it does not sustain positive change. (outside of consistent therapy). I also began to run support groups for the partners of cluster B’s and the children of cluster B’s. It was then I became interested in helping not only family to understand what cluster B disorders are, but helping others to identify them to avoid the inevitable harm that happens from trying to create emotional intimacy with these types of disorders. Today, the institute is one of the leading experts regarding the relational harm produced in these relationships. Our work has been called ‘pioneering’ and we provide the widest range of services for the children of and partners of cluster B’s. We also provide professional training for mental health providers, the legal system, domestic violence agencies and other first line responders who are likely to encounter cluster B’s or their partners. RT: Why do you think Public Pathology Education is so crucial? SB: I created the term ‘Relationships of Inevitable Harm’ because there are no happily ever after in these relationships. People who have this level of pathology have not only unsuccessful relationships; they have destructive, dangerous and damaging relationships. Partners, who have far less pathology than the Cluster B, are always always always negatively impacted by exposure to that much pathology. In fact, over 50% of the partners (even without the experience of violence in the relationship) will come out of the relationship with PTSD (post traumatic stress disorder). Pathology is the single most negative impact on society. Who stalks? Who abducts children? Who perpetrates parental alienation? Who creates high conflict divorces? Who has repeating patterns of domestic violence? Who has pathological lying and conning? We are almost always talking about cluster B disorders when we are talking about the most egregious behaviors. But they are often also the most successful, charming and un-detectable. Dr. Robert Hare, the Worlds leading expert on the worst of the cluster B’s, the psychopath, calls them ‘Snakes in Suits’. The lack of public pathology education means people have no way of identifying them before getting into relationships. Successful female attorneys, doctors, nurses, teachers, social workers, pilots, and accountants… have all been reduced to impaired status and put on disability to recover from these relationships. If that was a medical disorder they had to recover from, there would be a foundation and there would be a billboard campaign across this country. But it destroys people and no one has championed the cause. RT: By your own calculations, over 60 million people are affected to some degree or other by other people’s pathologies in the United States alone. Anything from being murdered to abused, to having your kids harmed, your bank account drained, or your things stolen. You also say that most of the pathological s are untreatable. It’s not as if you can send them to therapy and they will be cured. What do you think should be done with pathological, and if they can’t help the way they are how can they be held accountable for their actions? SB: Is Alcatraz still for sale? That was one idea. Since it is not a crime to be a pathological, it’s only the behaviors that are caught that might be a crime; the best way of helping to deal with the issue of pathology is in prevention. While schools are teaching about bullying in middle school, we could be teaching how to identify the worst forms of pathology. Who do with think Bullies are? Cluster B’s bully. We are using the wrong language in what we are teaching about dating violence, stalking and bullying. We need to add the dimension of ‘Who Does That?’ if we only look at the behavior and we don’t look at the mental health of the person we will never connect the dots. These people are not insane. They know right from wrong and pick wrong because it’s more powerful, effective and enjoyable. They are responsible for their actions. But I think understanding the permanence of the cluster B disorders helps the hopeful victim to understand ‘What you see is what you get’ and move on. We have had more success in teaching victims the neuroscience of the cluster B brain than domestic violence shelters have in teaching the ancient power and control wheel. RT: Briefly, how would you define a pathological? SB: The cluster B personality disorders: histrionic personality disorders, borderline personality disorder, narcissistic personality disorder, anti social personality disorder and in addition sociopaths and psychopaths. All of these have the basic inability to grow to any authentic emotional spiritual depth, and inability to sustain positive change, outside of ongoing therapy which no one is going to consent to, and the inability to develop insight into how their behavior affects others. With these inabilities is coupled a reduced empathy, and for some no conscience and remorse. Also, part of the hard-wiring is an impulse control problem which is why these are the people sent to Anger management, batterer intervention, etc. RT: Most people would immediately think of sociopaths and psychopaths at the mention of psychopathology. Sociopaths and psychopaths might be the most dangerous of all pathological s, since they totally lack a conscience or any social skills and are not likely to grow one any time soon. What are the other kinds of personality disorders that are pathological? SB: They represent the far end of the spectrum with almost no conscience, empathy or remorse. But the other end of the spectrum, those with borderline, narcissistic and antisocial personality disorders, presents problems too. Their reduced empathy is enough to harm others. Their impulse control problems make them violently risky. Their hard-wiring of not learning from experiences means the behavior doesn’t change while the victim keeps hoping for change. To see the neuroscience behind these disorders is to understand these are serious disorders that even therapy or medication are not going to control completely . RT: Can a person have several of these pathologies? For example, could they be both borderline and narcissistic? Does the exact diagnosis make a difference to the people whose lives they will touch? SB: These are considered cluster disorders so most of them have more than one disorder, which is why the DSM-IV (Diagnostic and Statistical Manual of Mental Disorders, Fourth Edition) clustered them together. You get overlap. That is why you always see reduced empathy for instance in narcissists but also in antisocial. They all have impulse control problems, etc. Because they share similarities in behaviors across the disorders, they will often meet criteria for more than one disorder within the cluster. But in addition to that, most of them will also have mood disorders and often addictions. So when you write a list of their probable DSM diagnosis, it is quite complex. RT: What is it about pathalogicals that makes other people get romantically involved with them? If you meet them on paper, like in this interview, they sound like no one you would want to go near, yet a lot of people find themselves deeply immersed in relationships with pathalogicals. How do you explain this? SB: Pathology emerges in childhood. They often become aware of their differences. They don’t feel like other people so they don’t behave like other people. The desire not to be targeted for their differences encourages their adaptability as children. They are human psychologists and study others so to mimic and parrot. While they do not have adequate empathy, they have learned if someone cries, pat their hand or make their face look a certain way. They must over compensate for areas people would notice so they often become quite engaging, charming, or just outright liars, in order to appeal to others. They are often successful and bright. They have been compensating since childhood, so by the time they are 30 they have had a lot of years to improve their approach. RT: Am I correct in saying that one of the most common personality disorders and maybe the hardest to recognize would be borderline? SB: We know and identify more BPD than some of the other disorders. BPD is often more recognizable early on because of the anger, impulsiveness and overt out of control behavior. But that does not mean it is the most predominant. Because sociopaths and psychopaths hide well behind successful careers, they are often unidentified. 1 in 25 people have no conscience which has a lot of overlap with sociopaths and psychopaths. So I think we aren’t identifying those who hide well. RT: What is borderline personality disorder and how does it affect relationships? SB: Everything I mentioned above: impulsiveness, chronic anger, emptiness, neediness, low empathy. You can’t build a relationship on that. RT: Say you meet a nice, charming guy (or girl). Is there any way you can tell right of the bat that this is a person you should stay away from? SB: Women should do background checks. In my book “How to Spot a Dangerous Man Before You Get Involved” is a red flags dating list of behaviors that could be a clue. Women should also date slowly and believe what others tell her. So many women were clued in by other women and thought it was jealousy when they were actually being warned. Women need to get more mature about accepting info, and stop carrying the mentality of a high school girl when others are trying to give life saving info. RT: Not everyone who is a bit off beat, strange, or even violent or addicted is pathological. How do you tell the difference between those who are pathological – and no amount of treatment will be able to help them, and those who are not pathological, and with the right counseling could be helped? SB: You probably can’t. If someone is a ‘counseling project’ from the get-go, why in the world would you want to date them? Don’t start with someone who needs a mental health tune up. You are not in a relationship to fix someone. Women with lots of empathy need to find a place to exercise that, like at the homeless shelter or animal shelter, not in their personal relationships. They begin with the belief ‘everyone has something’ and take in people who are in need of help. She won’t be able to tell the difference between pathology and just help, and then she’s in the relationship and it turns out to be pathological. If someone needs mental health help, tell them to go and get it and come back when they can present their most healthy self for a relationship. RT: We know that pathologicals come from all walks of life. They can be rich or poor common workers or white collar professionals. How about the women (and men) they get romantically involved with? Are there any common denominators among them or could this literally happen to anyone? SB: We found a lot of common elements related to women who get in relationships with Cluster B men. Many of the elements did not fit the stereotypical ‘victim profile’ traits. The research was done testing temperament traits for unusual elevations, which is exactly what we found. Off-the-richter-scale type elevations in some major areas that contribute to not only why they are attracted to, but tolerant of, the most dangerous persons. Some of the heightened traits included hyper empathy, tolerance, attachment, trust and loyalty. 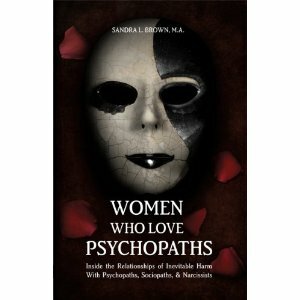 Half of the book Women Who Love Psychopaths covers the women’s traits and the amazing similarities among those who get involved with Cluster Bs. RT: Romantic Relationships with pathological are particularly hard to leave. In a way, this defies logic because they are also absolutely terrible to be part of. Could you explain why it is so hard to leave such a relationship? SB: Fear creates trauma bonding which increases the sensation of attachment. The longer the fear, the deeper the attachment. RT: Obviously being in a relationship with a pathological has a lot of fallout and long term effects on the other person. Could you share with us some of the things a victim of a pathological relationship would have to deal with? SB: Depression, anxiety, post traumatic stress disorder, loss of a job, productivity, chronic time in court, inability to sleep and function. RT: What are the obstacles a victim would face when trying to leave a relationship like this? SB: The pathalogicals are the people with the worst control issues and impulse control problems, which are a deadly combination. Abuse, stalking, child abduction, 60 times in court, broken restraining orders,these are the things a victim could expect. Victims need a safety plan made with a professional. This needs to be planned ahead of time. You can find out more about this here. RT: What help is available to them and how would they go about getting it? SB: The institute offers books, products, safety planning sessions, phone sessions retreats and referrals to therapists. ‘Fascinating interview! The most fearful part, at least for this reader, is that there appears to be so much overlap with pathologies that even those of us with advanced degrees could not discern the difference unless we did intensive study with Sandra Brown. Life is too short… but women are still too trusting, even in this day and age. “How to Spot a Dangerous Man …” sounds like a must read for all of us! Thanks for your knowledge and willingness to share, Sandra! Next PostDanielle Pierre: Know Your Full Potential!